James Casebere (born 1953) emerged in the Pictures Generation as an artist-photographer complicating the status of the photographic image alongside Cindy Sherman and Richard Prince. His earliest works dismantled the codes of American suburbia and the myth of the west, but he quickly arrived at the practice for which he is best known today: the construction of formally simplified architectural models-arenas, monasteries, tunnels, factories-which Casebere lights and photographs in his studio. In the early 1990s, as the ramifications of Michel Foucault's critiques of architecture and power took hold in American culture, Casebere's practice developed into a study of architectural typologies of the Enlightenment era, particularly prisons. The lighting in his photographs is dramatic, or rather it plays with the rhetoric of dramatic lighting, qualified by the sheer artifice of the architectural models themselves. Edited by Okwui Enwezor, this major mid-career survey includes several of Casebere's lesser-known early works, as well as previously unreproduced sculpture and photographs from 1975 to 2010. Enwezor contributes both an introduction and a conversation with the artist. The volume also contains essays by Hal Foster and Toni Morrison. 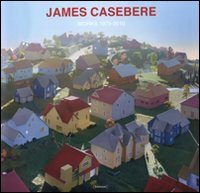 James Casebere: Works 1975-2010 is the most comprehensive monograph to date on this important American artist.